Publishing in School Psychology and Related Fields aims to help students, early career professionals, and seasoned scholars alike better understand the process of peer-review and publishing in journals, books, and other professional-oriented forums. Edited by a former editor of the Journal of School Psychology and containing chapters from insiders who have operated as productive authors, reviewers, and editors, this informative new resource contains practical and invaluable advice for anyone looking to increase their scholarly productivity and jump start their career. "This highly readable and informative book should be required reading for anyone interested in publishing in school psychology and related fields. Graduate students, early-career scholars, and seasoned professionals will find the advice contained in this remarkable volume to be practical, valuable, and wise. Covering a broad range of pertinent topics, it is an essential resource for anyone interested in better understanding the publication process and enhancing their own writing skills." "Floyd has created a unique resource that will be valuable to anyone that currently or aspires to publish school psychology research. The book combines research on the process of publishing in school psychology, insider advice, and input from journal editors as well as respected scholars to provide the reader with actionable recommendations to maximize the likelihood that their work will be seen by a broader audience." 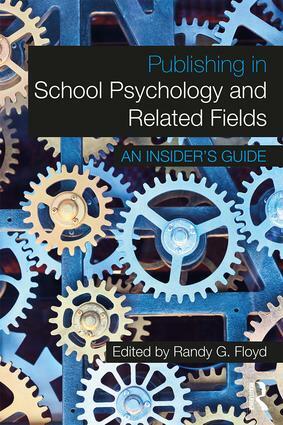 "Publishing in School Psychology and Related Fields is a unique, comprehensive guide to all phases of authoring and publishing activity in school psychology. Accomplished journal and newsletter editors provide an insider’s view of the publishing process as well as detailed, extremely helpful information and strategies that will be invaluable for prospective authors. This book should be required reading for everyone seeking to publish in our field, ranging from graduate students to senior scholars." "In the first book of its kind, Dr. Floyd explains and demystifies publishing in school psychology in a clear, insightful and approachable manner. This book will increase the rigor, impact, and translation of research, especially among graduate students and early career scholars. Dr. Floyd’s contribution has the unique ability to advance scholarship (both in critique and production) for all readers – thus, the impact of this text is immeasurable." "Although disseminating scientific work is essential to the field of school psychology, no one has described the process of peer review and publication. This exceptional book fills a significant void in the literature by comprehensively providing pragmatic guidelines for writing and publishing in school psychology. I strongly believe this book will serve as a critical resource." Randy G. Floyd, PhD is a Professor of Psychology, Training Director for the School Psychology doctoral program, and Associate Chair in the Department of Psychology at the University of Memphis. He has contributed to more than 80 publications and is the former editor of the Journal of School Psychology (2010-2014).